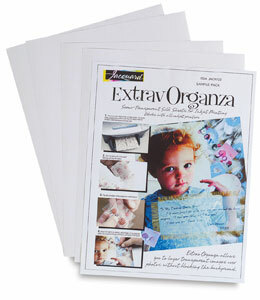 Use an inkjet photo printer to print your own images on delicate organza. Create beautiful embellishments for collages, cards, scrapbooks, textiles arts, crafts, altered books, and more with Jacquard ExtravOrganza. This unique, semi-transparent silk organza fabric sheet is versatile and easy to use. Simply run it through your inkjet printer or inkjet copier, cut it to size, peel away the backing, and apply. Sheets measure 8½" × 11" (22 cm × 28 cm). Jacquard's inkjet printing products allow you to print directly onto cotton, silk and Extravorganza to create fun and exciting wearable or home decor pieces. The fabrics are backed with paper and go right into your Inkjet printer or copier. Print anything from photos to original art work.